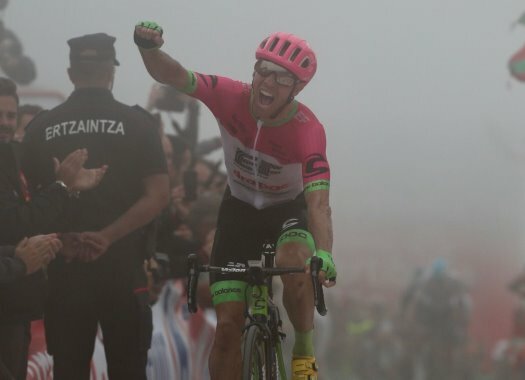 EF Education First's Michael Woods has taken the victory at the 17th stage of the Vuelta a España. The rider was part of the breakaway of the day and crossed the finish line ahead of Dylan Teuns and David de la Cruz. The riders went through a 157-kilometre course between Getxo and the Balcon de Bizkaia which featured a mountain finish on a first category climb. The day started with several attacks that resulted in the breakaway of 26 riders with names like Vincenzo Nibali, Alexandre Geniez, Omar Fraile, Bauke Mollema, Rafal Majka, Michael Woods, Ilnur Zakarin and David de la Cruz, among others. Behind them, the peloton was mainly pulled by Astana, which wanted to set a high pace for its leader Miguel Angel Lopez. In the front group, De Gendt managed to take enough KOM points to put himself at the top of the mountain classification. Just before the final climb, Fabio Aru (UAE Team Emirates) had a problem with his bike and crashed, showing some abrasions in the lower part of the back. With three kilometres to go, Teuns and Clarke attacked from the front of the peloton, while Movistar's Alejandro Valverde launched an attack at the favourites' group. A kilometre later, the rest of the escapees rejoined the front group while Adam Yates and Jack Haig closed the gap for their leader Simon Yates and left Nairo Quintana struggling at the back. With 1.4 kilometres to go, de la Cruz attacked and Woods stayed at his wheel while the rest stayed struggling at the back. Half a kilometre later, Teuns and Majka joined the front to face the last kilometre of the stage. The Belgian launched an attack right away and was followed by Woods, who managed to go away from the rest in the last metres. Meanwhile, Lopez attacked from the favourites' group but was soon reeled back in by the others. Woods crossed the finish line on his own, taking his first victory in a grand tour, while Teuns and de la Cruz completed the top three of the day. Valverde was the first one of the favourites and he was followed by Mas and Yates. Yates maintained the lead of the General Classification. Mas climbed to the third position of the overall standings while Kruijswijk fell to the fifth position behind Lopez.